Background: A new, simple, specific and sensitive reverse-phase liquid chromatographic method was developed and validated for the estimation of felodipine (FDP) in rabbit plasma using fluorescence detector. 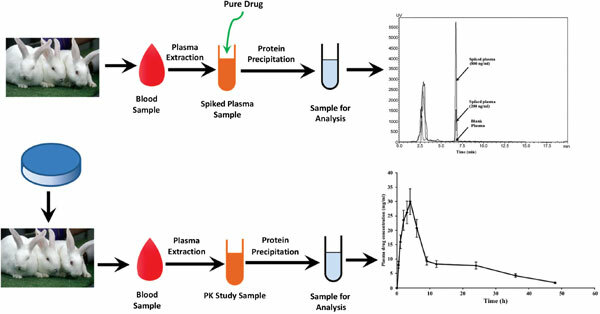 Materials and Methods: Plasma standard were prepared using a simple and one-step protein precipitation method and 50 μ l of the standard solutions were injected into the column. The method was found to be linear in the concentration range of 10–1000 ng/ml. The developed bioanalytical method was validated as per standard guidelines. Validation study results demonstrated accuracy, precision, sensitivity and selectivity of the proposed method. Results: The developed method was successfully employed in the determination of FDP in plasma samples obtained from the pharmacokinetic study of the immediate release tablets in rabbits. Keywords: Felodipine, fluorescence detector, high-performance liquid chromatography, rabbit plasma, pharmacokinetic study, oral tablet. Keywords:Felodipine, fluorescence detector, high-performance liquid chromatography, rabbit plasma, pharmacokinetic study, oral tablet. Abstract:Background: A new, simple, specific and sensitive reverse-phase liquid chromatographic method was developed and validated for the estimation of felodipine (FDP) in rabbit plasma using fluorescence detector.